We are proud to introduce our new Calacatta Quartz Stone for most of our vanities. Answering the prayers of many of our customers, the Calacatta quartz has the elegance and grace of Calacatta marble as well as the strength and durability of quartz stone. Calacatta is a luxurious, white, Italian marble that adorns many churches, cathedrals, and castles around the world. It has a mix of grey and gold hues that accent the bold, bright white, giving it its divine appearance. 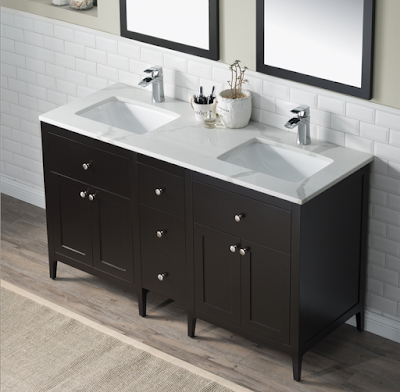 And now, for the first time ever at Bathroom Place, we have it available in an exquisite quartz vanity. This exciting new design is one that we encourage our customers to consider due to its gorgeous allure. However, a quartz countertop is very different than a porcelain one, so it’s important to examine a few things when considering quartz counters. Quartz is a very attractive, manufactured product. The manufacturing process creates a much wider range of colors that you may not find in natural stones, like marble or granite. Once completed, the finish is beautiful and creates a sense of depth to the stone that makes it a luxurious choice for kitchens, outdoor areas, and bathrooms. It adds visual interest and eye-catching accents to a room. Although you may not think so at first, quartz has the same durability as concrete and granite. However, it outranks them in longevity because quartz does not chip or crack easily. Like other hard surface countertops, quartz is non-porous, meaning it won’t allow liquid or air to pass through it. This makes it much more resistant to staining, as opposed to granite, concrete, and marble which can stain quite easily. The non-porous surface also means it won’t harbor bacteria or viruses deep down in it the counter. Having a bathroom countertop that cleans easily, is hygienic, and elegantly attracts the eye would be a great choice for anyone. Fortunately, there are not too many downsides to owning quartz counters. The striking visible quality of quartz countertops, and specifically, Calacatta quartz, may be off-putting to some. Because it is such an elegant and beautiful look, some homeowners tend to stick with more basic designs textures, such as wood or slate. However, if a graceful look is what you’re going for, then a quartz countertop is definitely the best option for you. Another thing to consider is the price. Some may argue that the price tag is a huge deterrent for consumers, which at some places, it can be. However, at Bathroom Place, we offer affordable bathroom counters that will give you the elegance and style you’re looking for without burning a hole in your pocket. 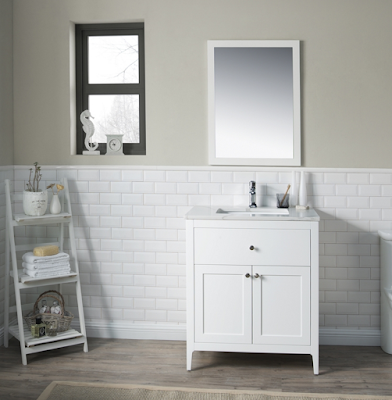 We offer excellent prices on stunning vanities, and we have not sacrificed either for this exquisite new product. Calacatta quartz stone will give you a beautiful bathroom vanity that is upscale and low maintenance. The lovely, off-white shine pairs perfectly with dark colors, but is not so drastic that it could not blend well with others. The Calacatta stone is sleek, modern, and would be a tasteful and elegant addition to any home. 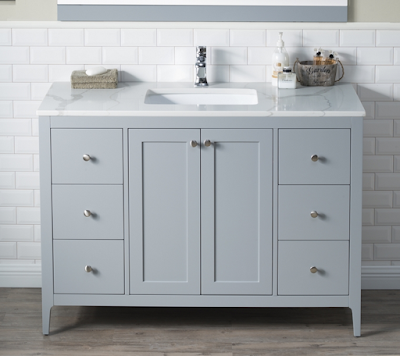 Check out this amazing quartz vanity today and start your journey to a charming new bathroom.